Keep all workers safe no matter what job site they visit with one of the excellent portable multi gas detectors and single gas detectors offered here. When working at industrial facilities or with utilities, various gases can leak into the air and make the area dangerous for the workers. A confined space gas monitor can fit in the palm of your hand or even clip onto a belt. 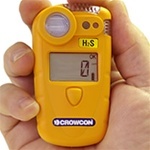 The portable single gas detectors such as the CO and H2S gas detector constantly monitors the surrounding air for carbon monoxide and hydrogen sulfide, and 4 gas monitors also check for oxygen and combustible gas. Whether you need a disposable single gas monitor for a particular job or would rather have a more advanced device such as a multi gas detector reliably for a long time, you can find the right gas detection equipment here. Crowcon T4 Portable 4-Gas Confined Space Monitor with Rechargeable Battery. GfG G450 4-Gas confined space monitor with rechargeable NiMH battery pack.